My heart sank when I opened up the Google Reader after a busy few days; more than 1,500 items is way too many to be able to keep on top of with a quick scan through. So I weighed up the work/life balance and MAAR-ed without a backward glance – apart from Mashable’s feed, which is always worth a quick delve. 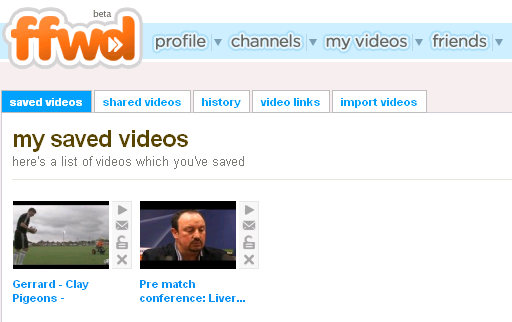 And so it proved again, tipping me off to an interesting tweak to video-sharing site Ffwd. Among other things, Ffwd lets you import videos to your online library from various locations – Youtube, Break, Spike, MySpace, MetaCafe, Blip.tv, and Daily Motion – or upload your own from Youtube and Vodpod. Once in your library, you can share them with friends, by sending them links. 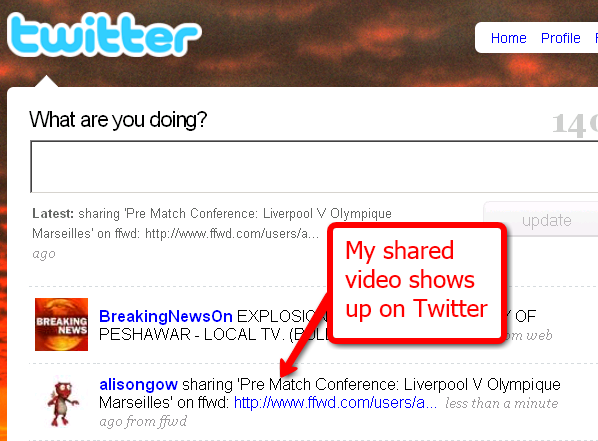 And now users can cross-post to Twitter when sharing a video. That sounded like something that might work with our Daily Post YouTube and Twitter accounts so I signed up to see if/how it worked. First I embedded two videos that had gone on our website that day (one from our YouTube channel, one from a blog embed) into my library. Then I was ready to share the video. Obviously you have to share a video with someone, so I needed to find a willing victim – in this case the Echo’s design editor, Gary Bainbridge. He’s accustomed to being my guinea pig on such random tests that he merely shrugged resignedly and joined. It doesn’t appear as an @ tweet though – just a standalone message that also cross-posts to my Facebook status and Friendfeed. If I had sent it out as the Liverpool Daily Post, as opposed to myself, it would have been published in the Daily Post’s LFC Twitter stream. It’s a simple way of alerting an audience to new content, although I wouldn’t say it was any more effective than tweeting a shortened url to the YouTube channel. What it does do however (although Ffwd stresses it is not a social network) is give users the opportunity to share content quickly among themselves, while building their own online library/channels of content. That means the Rafa video has a new market in which to get picked up and send on; it also means, I think, that the addition of an unobtrusive LDP logo on the film could be useful. So, interesting, potentially useful and free to join and use. Worth investigating further I think. WoW shares many < HREF="http://www.game4power.com/" REL="nofollow">wow gold<> of its features with previously launched games. Essentially, you battle with < HREF="http://www.game4power.com/buy-gold/" REL="nofollow"> wow gold cheap <> monsters and traverse the countryside, by yourself or as a < HREF="http://www.game4power.com/buy-gold/" REL="nofollow">buy cheap wow gold<> team, find challenging tasks, and go on to higher < HREF="http://www.aocsale.com/" REL="nofollow">aoc gold<> levels as you gain skill and experience. In the course of your journey, you will be gaining new powers that are increased as your skill rating goes up. All the same, in terms of its features and quality, that is a ture stroy for this.WoW is far ahead of all other games of the genre the < HREF="http://www.gamelevelup.com/" REL="nofollow">wow power leveling<> game undoubtedly is in a league of its own and < HREF="http://www.wowgoldone.com/" REL="nofollow">cheapest wow gold <> playing it is another experience altogether.Even though WoW is a < HREF="http://www.wowgoldone.com/" REL="nofollow"> Cheap Wow Gold <> rather complicated game, the controls and interface are done in < HREF="http://www.vipwarhammergold.com/" REL="nofollow"> warhammer gold<> such a way that you don’t feel the complexity. A good feature of the game is that it < HREF="http://www.itemstores.com/" REL="nofollow">buy wow items<> does not put off people with lengthy manuals. The instructions < HREF="http://www.bygamer.org/" REL="nofollow">bygamer<> cannot be simpler and the pop up tips can help you start playing the game < HREF="http://www.itemchannel.com/" REL="nofollow">World Of Warcraft Gold <> immediately. If on the other hand, you need a detailed manual, the instructions are there for you to access. Buy wow gold in this site,good for you, < HREF="http://www.game4power.com/" REL="nofollow">BUY WOW GOLD<>.